Businesses that once focused almost entirely on honoring the dead are now open to an array of events as they seek to add revenue. INDIANAPOLIS, IN -- Danessa Molinder entered the courtyard wearing a white dress and matching veil. Her groom waited at the other end, in front of decorative doors and lattice work that blocked the view of a nearby cemetery with 73,000 graves. 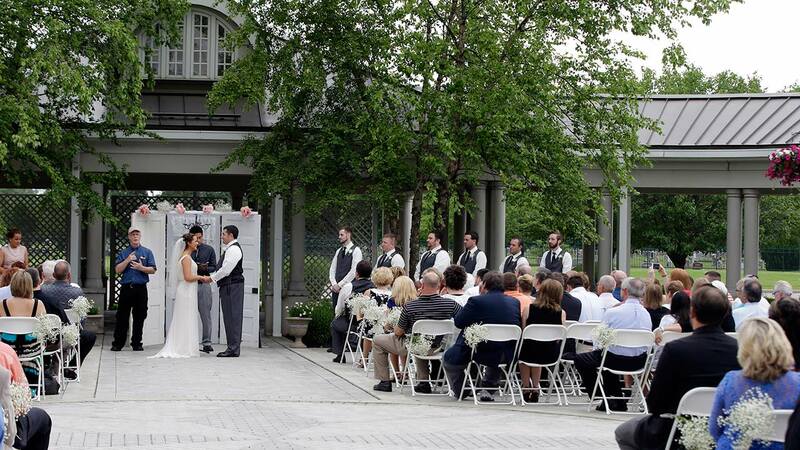 Molinder's June wedding was one of more than 50 that will be hosted this year at a $10 million events center run by the Washington Park East Cemetery Association in Indianapolis. The somewhat ironically named Community Life Center sits on cemetery land near a funeral home and also has hosted a prom, community banquets and even breakfasts with Santa. "It's such a beautiful building," Molinder said. "That's what really drew us to it." Funeral homes aren't just for funerals anymore. Businesses that once focused almost entirely on honoring the dead are now open to an array of events as they seek to add revenue. Cemetery and funeral home operators say they're being squeezed as more people favor simpler, less expensive funeral services. Their businesses also are being pressured by the growing popularity of cremations, which can bring in less than half the revenue of a traditional casket burial. Cremations are expected to become the most common form of body disposition nationally in a few years, according to the Cremation Association of North America. Funeral home operators also say there's a need in their communities for locations that can host weddings or other big events, and people are no longer hung up on their main business. Declining membership in churches and civic organizations also may be boosting demand for nontraditional venues for weddings and receptions. As a result, funeral homes and cemeteries nationwide have been marketing their properties for an array of uses. Nearly 10 percent of 280 respondents to a National Funeral Directors Association survey last year said they built a community center to host other events. That's up from 6 percent in 2011. "As a business, we need to find ways to keep growing," said Bruce Buchanan, a member of the Indianapolis cemetery association's board and owner of a funeral home business. Younger generations are growing up without the same stigma toward death that their parents and grandparents had, said Mike Nicodemus, a vice president with the National Funeral Directors Association. "People aren't as religious as they once were ... and their attitudes toward death are changing," he said. "Funeral homes were seen for one reason: to have a funeral. Now they're being used for all kinds of things." That versatility might be appealing to couples who need a place to host their big day but aren't affiliated with a religion, said Stephen Prothero, a Boston University religion professor. He said that theory comes with a caveat: The site should have some separation between the wedding and funeral businesses, because there's a cultural taboo against mixing death too closely with weddings, which often are about birth and the starting of families. Chelsey Lesnick picked a suburban Cleveland funeral home that her grandparents opened in 1949 as the site for her nuptials last March. The home's second-floor reception center - not the funeral site downstairs - hosted the service and the party afterward for about 50 people. Lesnick, 24, said the site didn't feel like a "house of death or a place of mourning." "It felt like a place of love and just bright happy joy on that day, it really did," she said. Despite their growing openness to holding various events, funeral directors and cemetery executives say they haven't replaced their main business. Matt Linn built a multi-use facility in 2008 after a flood damaged his funeral home. His Cedar Rapids, Iowa, business now runs three wedding venues and two locations that can host weddings and funerals. It also manages a golf course and runs a farmer's market. Non-funeral related events still amount to only about 20 percent of total revenue for Linn's business. But the versatility helps with his main line of work. Even when people are looking into holding services for a deceased loved one, they're opting more for celebrations of life filled with slide shows, food and alcohol, instead of a traditional viewing and service that stretches out over a few days. "I don't think I've coordinated a (traditional) funeral in a long time because they're depressing things," he said. Events at the Community Life Center in Indianapolis account for only about 5 percent of the Washington Park Cemetery Association's total revenue. The center's wedding business didn't really take off until four or five years ago. Now, it's booked nearly every weekend this summer for weddings and is taking 2016 reservations. "The words I love to hear, and I hear them all the time, is, 'I didn't know you could do this,'" said Buchanan, the cemetery association board member. Peak rental rates for the Community Life Center approach $4,000. That is less than half the average rate of $9,837 in Indiana, according to the wedding planning website TheKnot.com. Molinder, the Indianpolis, bride, said the center's rates were comparable to other venues they considered. The center grabbed her attention in part because it was easy for her guests to reach and could host both the ceremony and reception. That convenience helped the 250 people who attended her wedding dodge rain that had been brewing in the gray clouds overhead. Guests were able to take a short walk from the courtyard into the center after the ceremony. Once inside, they sipped drinks and mingled around a fountain in the center's rotunda, which is laid out in Italian marble, while they waited for the reception in a nearby ballroom. That fountain sat a short walk away from a darkened office where customers for the cemetery's main business can view casket samples. "Everything turned out perfectly," she said.